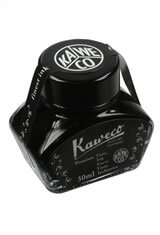 Kaweco ink is now available in a 30 ml bottle! Kaweco bottle ink is the same great ink found in the cartridge style but is now available to use with ink converters and piston style fountain pens. Get your Kaweco bottled fountain pen ink today! The Kaweco Bottled Ink(30ml) Fountain Pen Ink usually ships within 1 business day unless otherwise specified. Each Kaweco Bottled Ink(30ml) Fountain Pen Ink we sell is guaranteed to be genuine, authentic and will arrive brand new & unused! Excellent packaging, reasonable price, writes smoothly with a Kaweko Sport Classic, great value for use with your Kaweko! I have noticed that other sites list this as Kaweco caramel brown. Is this the same ink as Kaweco sepia brown? Yes the Kaweco ink in Caramel Brown is the same color as Sepia Brown.